This summer is not the summer of monster zucchini--not in my garden nor in our farm share. [It is, however, the summer that I harvested a 42 pound volunteer--meaning I didn't plant that--pumpkin the first week of August! You can see us here on my FB page.] Nope, all of the zucchini and summer squash has been harvested in lovely small tender sizes--perfect for grilling or slicing and using on a pizza. Then again I think everything is perfect for a pizza. I'm having an interesting summer so far with the produce from the Community Supported Agriculture (CSA) farm share. Normally my kids do not readily embrace all of the vegetables, so I shred and tuck them in here and combine there so that I'm serving meals that contain a lot of vegetables but don't have lots of single vegetables dishes, if that makes sense. This summer, the kids have realized how tasty a zucchini pancake (or crepe, or fritter) is, so we've been making them often. [Turnip fritters, too--and I've got a beet hanging out in the crisper waiting it's turn to fritter away . . .] They are also eating peppers and onions in their eggs and on pizza. Crazy--is it teenagers, or is it because it's our 9th season eating from the farm share (more than half of their lives, both of them!) and the constant exposure to all the vegetables has worked? Whatever the root cause, it is really fun to cook with my kids these days--they are willing to get up off the couch, put down the iPads, and shred/chop/grill/stir alongside me. And hold the reflector so I can try and take better photos for you. I'm realizing that the blog part of this post is not very coherent. I'll shut up and get to the recipe. If you've got time and inclination, it's pretty easy to make your own pizza dough. I did a brain dump of all things related to pizza in my Pizza Primer post, and I recommend you pop over and take a look. Otherwise, buy a ball of pre made dough--or use a pre baked pizza crust, or a piece of naan--and get topping. Vegetarian? Skip the bacon or use veggie bacon pieces. Like turkey bacon? I don't, but whatever floats your boat. It's summer--no need to stress out. Ignore the Asiago in the background. Cheese photobomber. Spices missing. I've also used my Fresh Tomato Pesto as the sauce for this pizza. We're getting lovely tomatoes in the farm share--the squirrels are sharing the ones in the garden with us--so that's an option, as is any old pizza sauce you prefer to use. 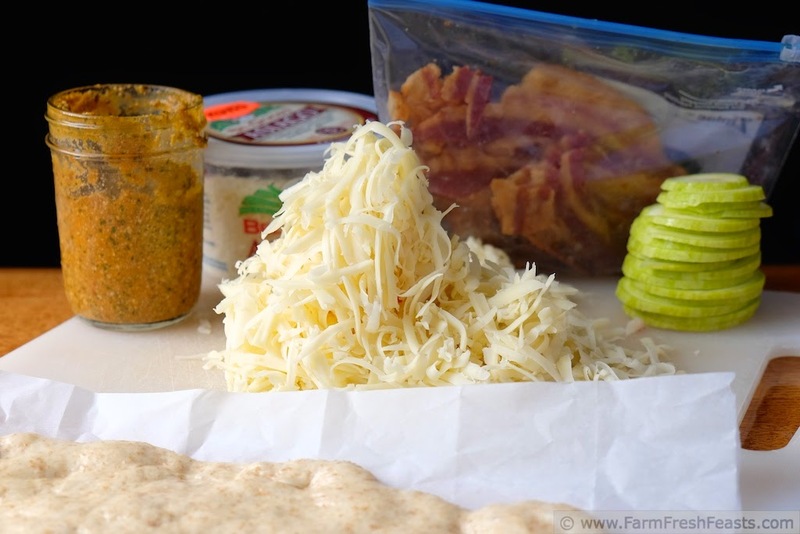 My favorite type of cheese for pizza is fontina, and I've used that here. I picked up a hunk at Trader Joe's, brought him home, and asked my son to shred half for that night's pizzas. My son complied--then told me he thought we needed more cheese. I trust his judgement--he's the chief cheese shredder around here nowadays--so he did the whole hunk. And I used it all! 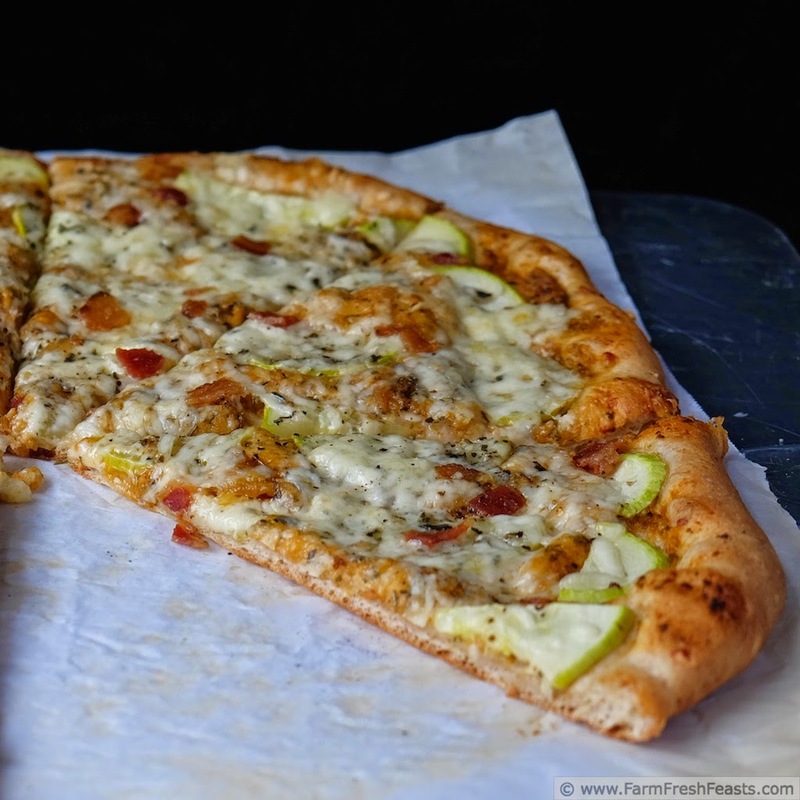 Copious amounts of cheese + bacon + using a zucchini from the farm share? Score! Preheat oven to 450 degrees Fahrenheit, and if you've got a pizza stone let it preheat as well. Spread dough on an oiled piece of parchment, brush with olive oil, and top with fresh tomato pesto. 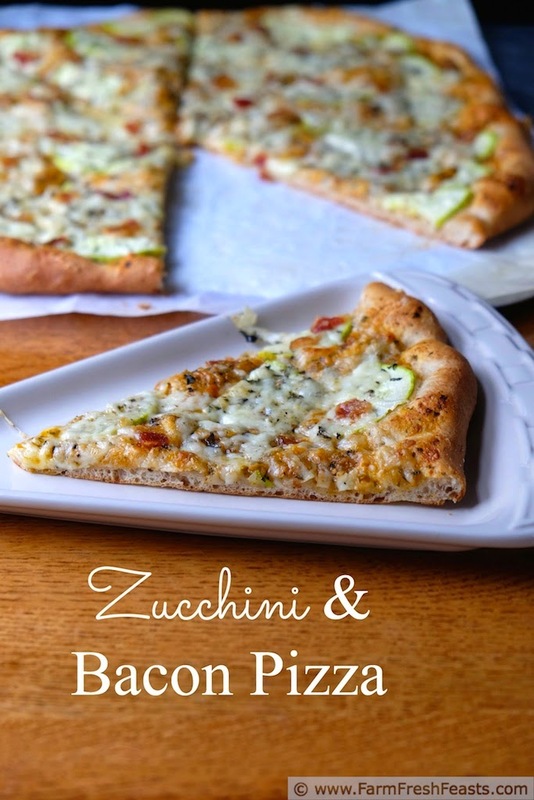 Add a layer of zucchini slices, top with cheese and bacon. Scatter Italian seasoning across the top. Bake, on the parchment paper, for 5 to 8 minutes. Shimmy the crust off the parchment and bake directly on a pizza stone or cookie sheet for another 3 to 5 minutes until the cheese is bubbly and browning. Cool on a rack and slice to serve. Also good with a few grinds of pepper and a pinch of salt on top of the zucchini. My family loves bacon pizza with either white or red sauce. Never thought about using pesto and italian seasoning. I was out for lunch with my photographer group and one brought along her kiddos (snow day). 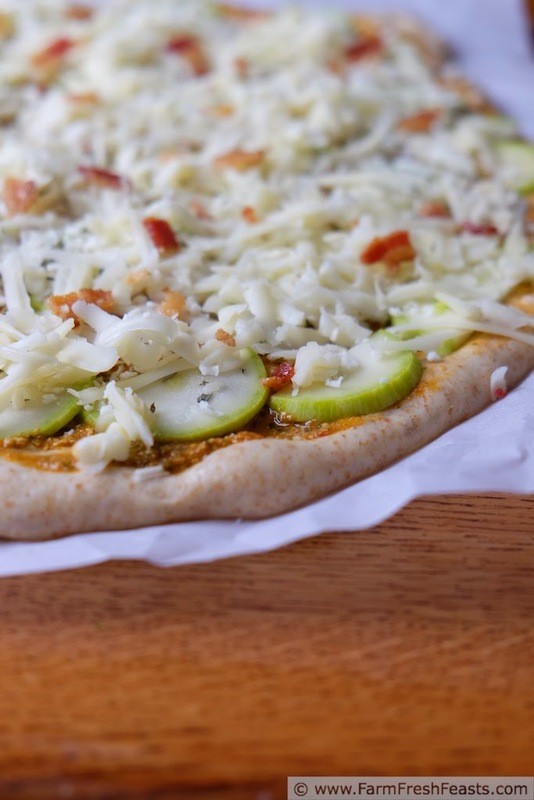 Her son designed his own pizza with pesto and bacon--what a clever kid! Your son has good taste when it comes to cheese, and I for one, enjoyed the non-recipe part of this post just as much as the actual eats. Persistence pays off and the kids eat veggies, non-hidden ones, that is. It's a win for all. This is right up my alley! Thanks for linking up with What's Cookin' Wednesday!